In California, we’re all about helping people who’ve fallen to get back on their feet: numerous welfare programs provide people with the food, shelter, and funds they need to re-integrate themselves into society. But Deacon Stephen Bentley doesn’t just help locals stand on their own two feet—he helps them ride on their own two wheels. A member of the church for 40 years and ordained for five, it was 2016 when Deacon Stephen felt the call to open The HUB. An acronym for “Helping Urban Bicyclists”, The HUB is a resource for the under-employed and homeless of downtown Stockton, giving them free bicycles and assisting them with their daily needs. As it turns out, many people do. 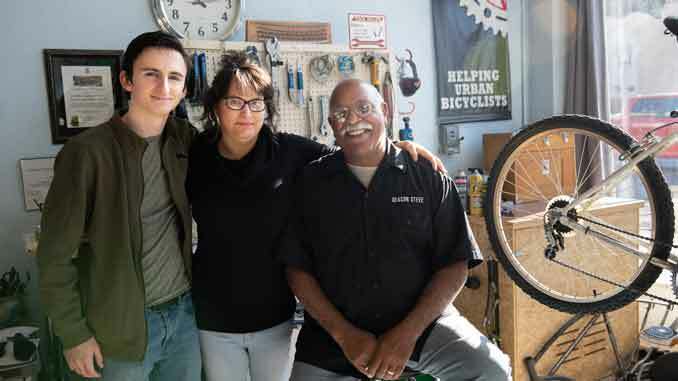 These days, Deacon Stephen and his team of volunteers see anywhere between 30 to 60 people a day, all of whom either need their bikes repaired, need transportation, or just need comfort and snacks. “Each person that walks in our door, once they come in they’re treated with dignity and respect,” states Deacon Stephen. Along with financial donations, The HUB also takes bike and bike-part donations. Mostly, they need inner tubes and cables. “And, if you have used wheels that spin true, we’re happy to receive those,” adds Deacon Stephen.